...pivoting to focus on innovation. Still blogging about copyright and occasionally on digitization. In honor of the SLA conference next week, I want to bring your attention to this book, You Don't Look Like a Librarian: Shattering Stereotypes and Creating Positive New Images in the Internet Age . It's author, Ruth Kneale, is one of my favorite librarians because of her interest in librarian stereotypes. I heard Kneale speak at the SLA conference in 2002 and I found myself intrigued by the topic. It's a topic often whispered about and now talked about more openly, in part due to Kneale's efforts. So why should you care about this book? The library stereotype can be seen all over the place, but likely you don't realize it: ads, movies, toys, books, comics and more. And while we might want to ignore the stereotype, those around us aren't. In fact, they're using it because there is a coolness to it. The book also contains information on people and organizations that are breaking the stereotype. (Full disclosure, I'm on pp. 93-94.) If you are new to the profession and wondering whose not looking like a librarian, this section will help! It's important to note that the book is built on solid research. Kneale doesn't take this subject lightly. You'll be impressed with the appendices, notes, and references. The book does have a companion web site which Ruth Kneale maintains in addition to her blog. If you are going to the SLA conference, look for the book in the Information Today booth in the Info Expo and ask about the book signings on Monday and Wednesday. 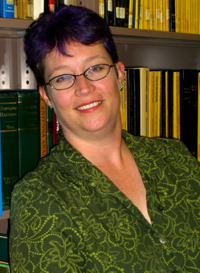 Jill Hurst-Wahl is a consultant, speaker, writer, researcher, and educator. She is an associate professor of practice in Syracuse University’s School of Information Studies, where she teaches graduate M.S. Library and Information Science (MSLIS) courses. Besides teaching, she leads the iSchool Public Libraries Initiative, a research group focused on providing more information to public libraries about what they and their communities need. Jill is the former director of the iSchool M.S. Library and Information Science program, which includes MSLIS: School Media (2012-2017). She is a member of the USNY Technology Policy and Practices Council (2009 to present) and the Onondaga County Public Library Board of Trustees (12/2016 to present). She is a former member of the Special Libraries Association Board of Directors (2011-2013) and of the Regents Advisory Council on Libraries (2007-2012). In 2019, Jill joined the board of the EveryLibrary Institute. She is the president of Hurst Associates, Ltd., which works with a broad range of organizations. This work/blog is licensed under a Creative Commons Attribution-NonCommercial-ShareAlike 3.0 License. FTC Disclaimer: Digitization 101 is an Amazon affiliate and receives a small commission if you purchase a product or service from an Digitization 101 Amazon link.